Ketogenic diet can be a little bit confusing and overwhelming at first, especially when you’re a complete keto beginner and you don’t know where to start or what to do. Understanding many new concepts such as net carb, macros and learning how to calculate your macros can be a difficult task for some people. At some point, you may find it even more overwhelming to gather all the right information, meal plans and recipes from the keto blogs or learn from YouTube videos. Sometimes you find conflicting information and don’t know which one to trust. This is when you’ll find it easier to keep one or more of the best books on keto diet topic at hand to look back for important information the second you need it. One of the problems with a lot of so-called “keto books” is that many books on the internet are written by ghost writers who have little to zero knowledge and experience about keto diet. Some of the books we come across even contain foods that are not keto-friendly! 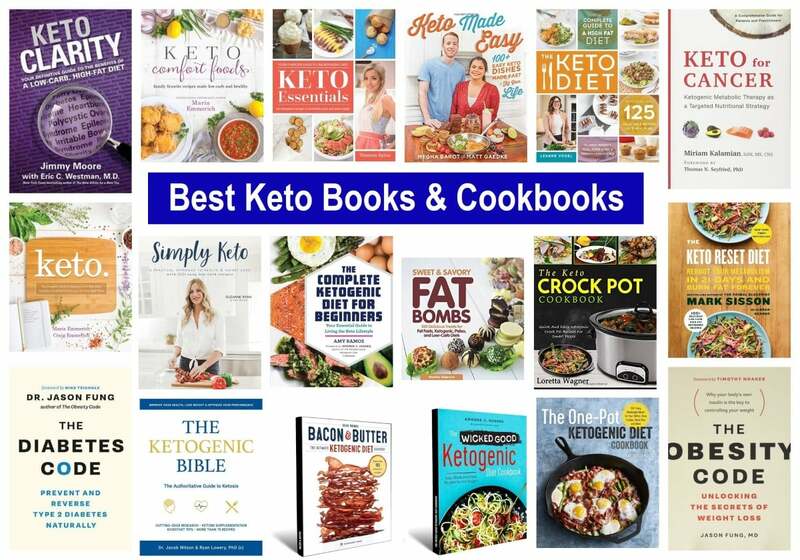 Fortunately, below are some of the best Keto books and Keto cookbooks that are written by keto experts and thought leaders in the keto community. These books are also recommended by hundreds of members in our own keto community as well as the feedbacks and reviews of many keto dieters on the internet. On this page, you’ll find a list of free books, paid books, digital ebooks and paperback books. Let’s get started! 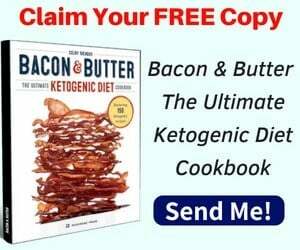 Bacon and Butter Ketogenic Diet Cookbook: This book contains 150 delicious keto diet recipes complete with nutritional information. Get This Book For Free Here! 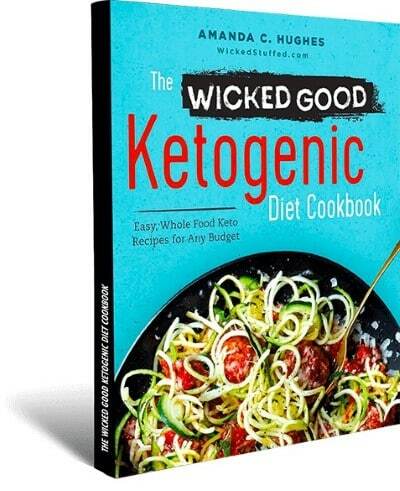 The Wicked Good Ketogenic Diet Cookbook: 156 delicious fat-shredding keto recipes inside this special edition. Those are the 2 quality cookbooks we found that are currently given away for free. The following lists are paid books that you can purchase online. The reason we love these ecookbook series so much is that they contains over 120 tasty and easy low carb recipes to follow. There are 30 breakfasts, 30 lunches, 30 dinners and 30 desserts for you to choose from. What makes this different from the rest of the cookbooks is that all of these recipes are made with just 5 simple ingredients and can be done in 5 easy steps. Each serving contains 5 net carbs or less which makes it perfect for your keto lifestyle. You can eat 1 breakfast, 1 lunch, 1 dinner and 1 dessert every day and still stay under 20g net carb limit. How amazing? 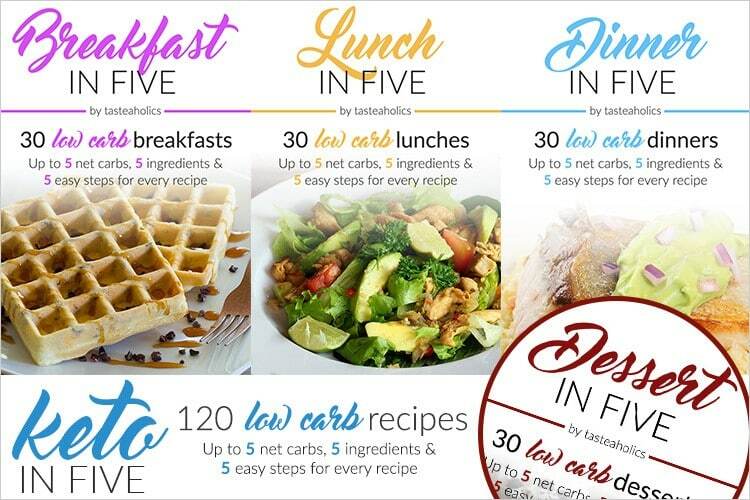 Go here to get this Keto in Five Bundle Now (currently at 42% OFF)! Leanne Vogel, the author of this book, is a nutritional educator and is the founder of Healthful Pursuit, a popular health blog. The Keto Diet book is a four-time national and international bestseller. Leanne came across the Ketogenic diet in 2014 and it has helped end her 8-year struggle with irregular periods, hyperthyroidism, hormonal imbalance, and adrenal dysfunction. Since then, she has used her blog and YouTube channel to share her experience and educate others about Keto diet. This Keto book aims to cover everything you need to know about getting started with the Ketogenic diet. One half the book is full of educational information for beginners and the other half contains Keto recipes. Something that you will appreciate about this book is that it’s not just plain text on every page but it also has a mix of interesting graphics to help you digest and remember key points easily. Another interesting thing about this Keto book is that it has an image recipe index so you can look at the images of each recipe at a glance to quickly decide which ones to try. 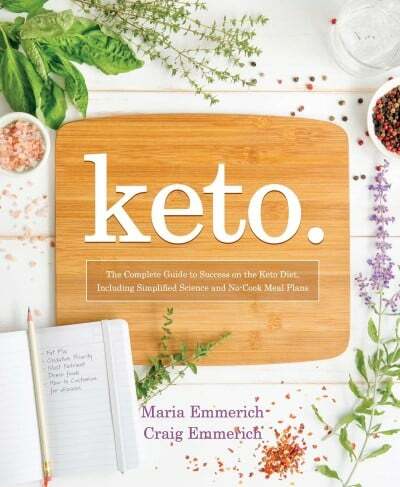 This is an educational Keto book written by Maria Emmerich, the founder of Keto-Adapted blog. Maria has also written several cookbooks and nutritional books, including a global bestseller. As the title says, this book is a complete guide to everything you need to know about the way your body works and how to get started with the Ketogenic diet. It really focuses on the science behind bodily functions and Keto diet. Don’t let the science part put you off because it’s written in an easy to read and understand style of writing. That being said, some people may see it as an information overload. If learning about the science behind everything to do with Keto diet is what you’re looking for then this book is a great choice. If you’re looking for a book with practical how-to tips then keep scrolling down. This is a comprehensive book about Keto diet for beginners. If you’re just getting started with the Ketogenic diet, this book will help you understand all the basics and science behind it. It really focuses on helping you understand what the diet is all about and goes into extra detail with the Ketosis part. The authors of the Ketogenic Bible book are award-winning researchers with Ph.D. level qualifications. Dr.Wilson, for instance, was awarded the NSCA’s Terry J.Housh Young Investigator of the Year Award. Lowery has also received several awards such as the Exercise Science Scholar of the Year. It also has a Keto recipe section and a FAQ answering all your Keto diet related questions. 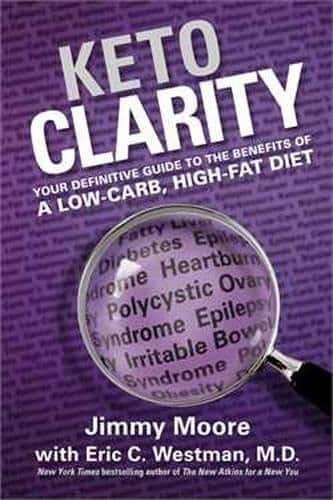 Keto Clarity is another best selling Keto book by Jimmy Moore, one of the authors of this book and a famous low carb diet blogger and podcaster. The fact that he has lost over 100 pounds in 100 days from following the Ketogenic diet is something that adds to the reliability of this book. Eric C. Westman, the second author is of Keto Clarity is an associate professor of Medicine, a practicing internist, and a low carb diet researcher. What’s unique about this Keto book is that it includes a collection of quotes from various health professionals and success stories to inspire you. It also has some easy to make Keto recipes in the back. 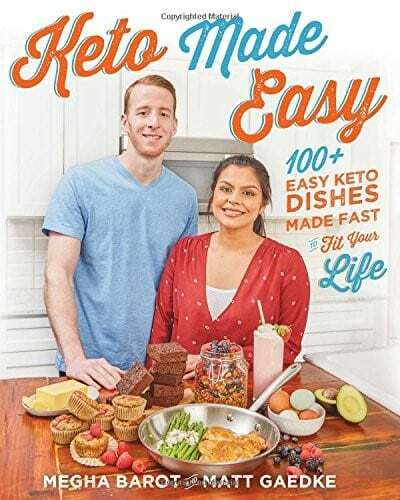 The authors of this book, Megha, and Matt from KetoConnect, are famous Keto YouTubers with a fast-growing YouTube channel. One big reason for their quick growing fame is their honesty and transparency in everything they share about Keto diet. A quick glance at some of their YouTube videos will make you agree with the above statement. This is the book for you if you want practical tips and friendly advice on exactly what to eat and what not to eat on a Keto diet. The beginning part discusses everything you need to know about the main Keto ingredients and how to prepare yourself before you start the diet. The choice of colors and graphics used would also make it easier for you to read and digest the information. 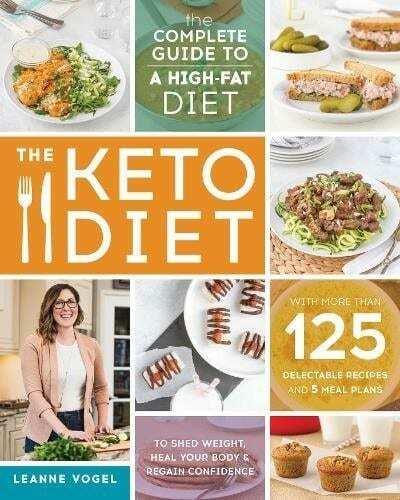 From helping you understand all the basics of Keto diet to meal plans and recipes, this book is a perfect all in one for anyone wishing to start the Keto diet. This is another practical book on Keto diet that covers everything from a shopping list, budget-friendly recipes, and a 30-day meal plan to help you get started. 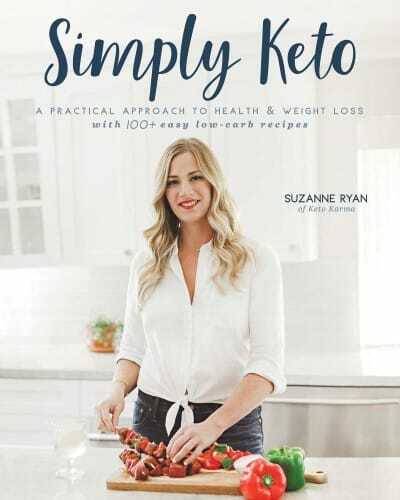 What makes this book more special is that the author of this book, Suzanne Ryan has lost 120 pounds ever since she switched to the Ketogenic diet in 2015. She’s the founder of KetoKarma blog and is also popular on YouTube and Instagram. She has also been featured on The Today Show. The before and after photos of her weight loss in this book also adds credibility to her advice and it’s one of the reasons that many people follow her on Social Media. Her own tremendous weight loss story really adds to the success of this book. 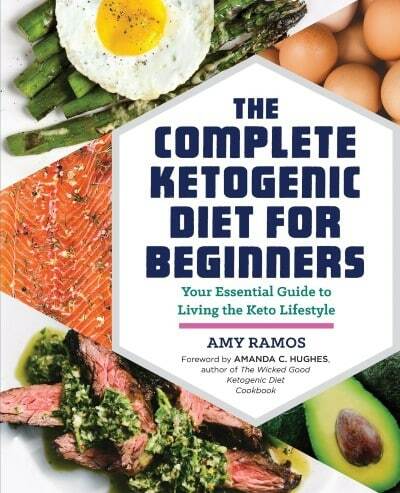 This book is a perfect choice for absolute beginners of the Ketogenic diet. It has everything you need to know what a Ketogenic diet is, the various benefits of Ketosis, and acts as a step by step guide to help you to embrace the Ketogenic lifestyle. For instance, there’s a section in the book that tells you how to get rid of toxic foods and what to replace them with. 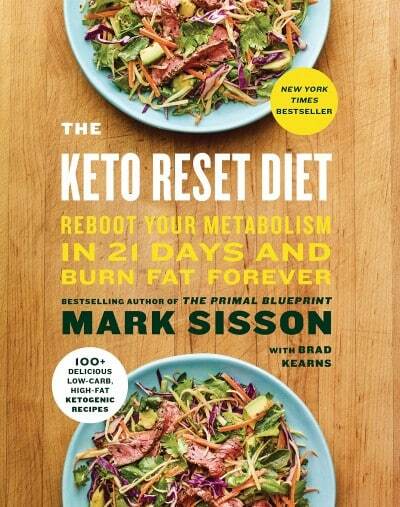 The author of the Keto Rest Diet, Mark Sisson is the founder of the famous Mark’s Daily Apple blog and he’s also the author of the ultra best selling book: The Primal Blueprint. Mark is also a former world-class endurance athlete. The main idea behind Keto Reset Diet is to help prepare your body to start using fat for fuel and become fully fat adapted before going on the full mode of the Ketogenic diet. So it doesn’t just give you some tips and information the what and how to part of the diet, but it also has a clear week by week diet plan for the 21 day reset diet. It talks about the things you can expect and the issues you might face when going into Ketosis such as Keto flu symptoms. The high-quality photos of each recipe is another big plus point of this Keto book. Overall, the Keto reset diet book is not only suitable for those starting or wishing to start the Ketogenic diet but it’s also perfect for those who tried and failed and want to start again the correct way. 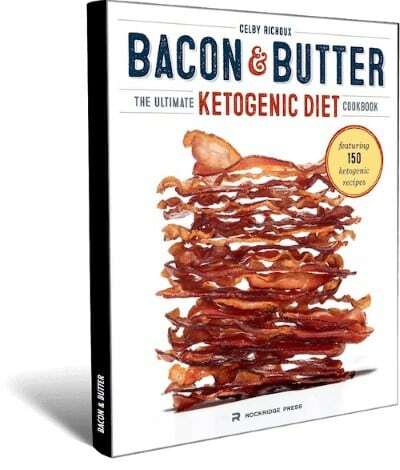 As the name of the book says, this really is a complete guide to anyone wishing to start the Ketogenic diet. 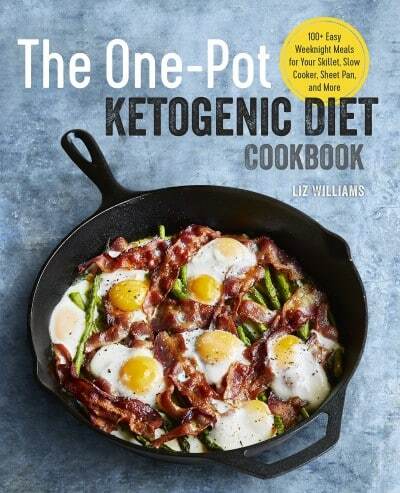 The first half of the book covers what you need to know about starting a Ketogenic lifestyle and then there’s a 14-day meal plan and shopping list followed by delicious Keto recipes. All the recipes have been divided into easy to navigate categories such as Veggies & Sides and Fish & Poultry. There’s even advice on what to/what not to eat when you’re going out to eat. The colorful tables, graphics, and images are also helpful to scan and understand important information. Each recipe on this book has macronutrient information so that you know exactly how much of your daily macros can come from each recipe and serving. 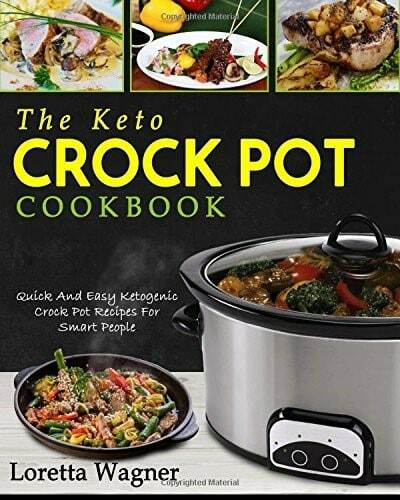 Amy Ramos, the author of this book has also written another great book called Easy Ketogenic diet slow cooking cookbook. She’s a professional chef with over 25 years of experience so you know the recipes in this book are coming from someone who knows exactly what they’re doing. 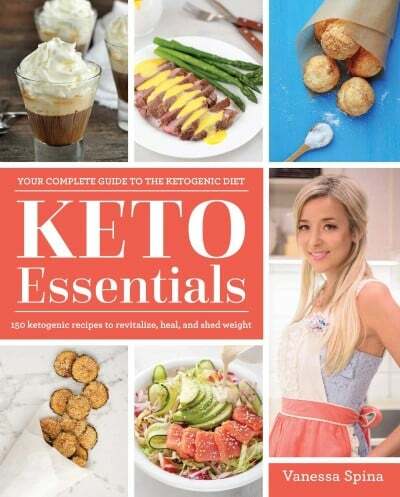 Keto Essentials is one of the best selling Keto cookbooks on Amazon. Vanessa Spina, the author of this book is the founder of the popular Ketogenic Girl blog, an International speaker, and she has also coached over 3,000+ people via her 28-day Ketogenic girl challenge program. This book is more than a cookbook. The first few chapters of the book cover important topics related to the Ketogenic diet such as Nutritional ketosis, the difference between Keto and other low carb diets, Ketone supplements, and more. The second half covers all the delicious Keto recipes and meal plans. You’ll also love the colorful pictures and graphics with easy to digest information in this book. Fat bombs are a great way to meet your daily fat requirement and they are so easy to make. This book is not just a list of recipes but it also has easy to digest educational information about the Ketogenic diet. 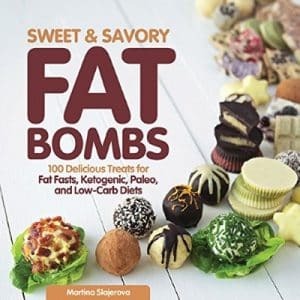 You’ll learn about Keto diet and the importance of fat bombs. You’ll also see black highlighted boxes with important information such as “Nut free” and “Dairy-free”. Slajerova is the author of several best selling Keto books and is also the creator of the Keto Diet App and blog. Her work has been featured in popular sites like the HuffPost, Cosmopolitan, Glamour, and Buzz Feed. Liz Williams from the fitketogirls blog has done a great job explaining all the basics of Keto diet and writing the recipes in a simple and easy to understand format. Each recipe on this book also has additional labels such as “Dairy-free” and “Egg-free” for those who might find it helpful to know at a glance. All the recipes in this cookbook also have macronutrient information so you know exactly how much of your daily macros you’ll be getting from each recipe and serving. Another thing you’ll appreciate about this book is that it doesn’t use any odd ingredients and only uses ingredients that you can easily find in any grocery stores. The recipes are also easy to adapt to suit the none Ketoers in your family by adding or removing one or 2 ingredients. This book, as the title says, is perfect for those who enjoy crock pot dishes and for those who want to save cooking time. The recipes in this cookbook are written in an easy to understand and follow format. You’ll also learn the basics of the Ketogenic diet, what you can/can’t eat, how to use a crockpot and more. The recipes in this book use a lot of easy to find budget-friendly ingredients. 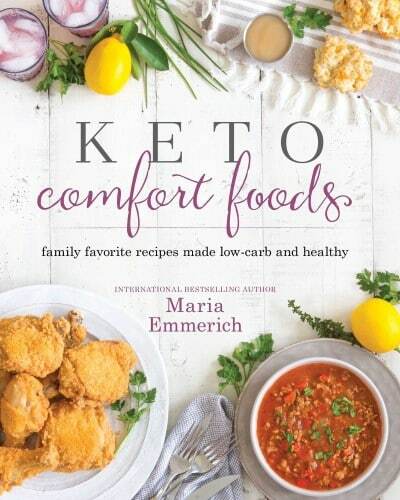 Some of the delicious and easy to make recipes from this Keto cookbook include Chicken and cabbage dumplings, Mozzarella shrimp parcels, and Pork & Chive meatballs. Maria Emmerich, the author of this book, is a nutritionist and a best selling author of several books including the “Quick and Easy Ketogenic Cooking” and “The 30 Day Ketogenic Cleanse“. Emmerich’s experience from suffering from PCOS related infertility and weight loss made her search her way into the Ketogenic lifestyle. Now she’s an International bestselling author helping many people across the world with her books, blog posts, and videos. Something unique about this cookbook is that every recipe has nutritional information on it so you know exactly how much they make up for your daily macros. There’s also a photo a recipe index in the back to help you get a visual treat of what you’re going to eat before you make it. Dr. Jason Fung, the author of this book is a nephrologist and a world-leading expert on low carb diet and Intermittent fasting. He works with the Diet Doctor team to educate the importance of intermittent fasting and how it can help treat health conditions like diabetes and obesity. Dr. Fung also has his own fast-growing YouTube channel and Facebook group. This book focuses on breaking the myths about weight loss and medicine for diseases in the modern medicine. It educates the importance of insulin and Intermittent fasting for weight loss and diseases. There’s also a section that guides on what to and what not to eat. 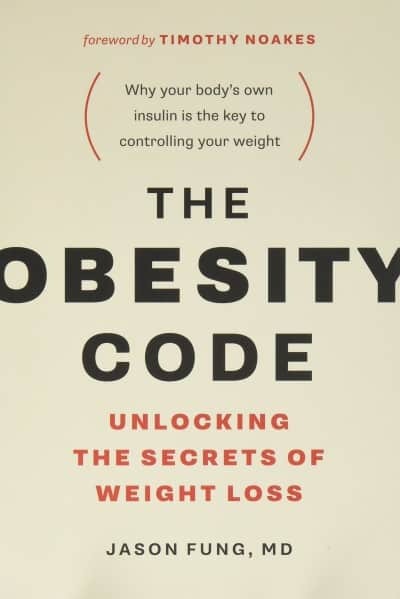 The Obesity Code is perfect for those suffering from obesity and/or diabetes and also for those want to learn about the benefits of Intermittent Fasting. 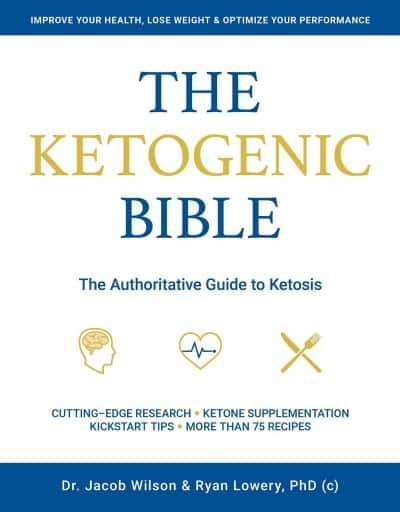 This book combines all of the valid research that’s been done on the benefits of Ketogenic diet into a practical guide and easy to read guide for those whom it may benefit. It focuses on how you can work with your medical team to create a personalized Keto diet plan to aid in the treatment. 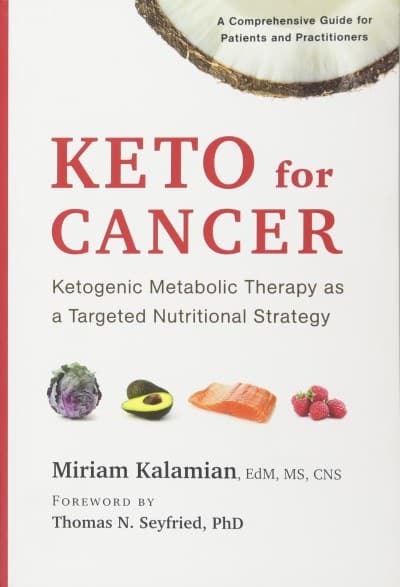 Miriam Kalamian, the author of this book is a leading Keto expert and a nutrition consultant and educator. The moment that drove her to the Ketogenic diet world was when her son Raffi was diagnosed with a brain tumor in 2004 and standard treatments failed to stop cancer from advancing. So overall it’s not just a scientific theory book about Keto diet and cancer but more of a practical how-to guide to help you get started. 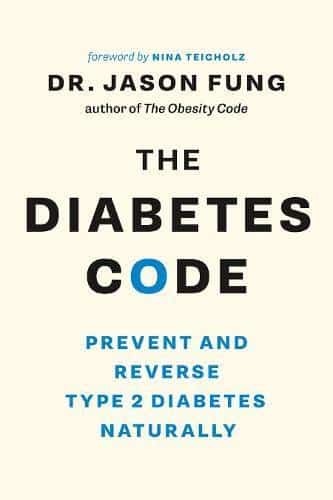 Dr. Jason Fung, the author of this book is also the author of the Obesity Code book we discussed earlier. In this book, however, he has focused completely on how you can reverse Diabetes 2 with the help of food and fasting. The chapters from this book cover everything you need to know about Diabetes, Insulin, and Intermittent fasting. Dr. Fung also believes that the only way to treat type 2 diabetes effectively is not by medication but intermittent fasting and proper dieting. He also explains why the conventional treatments for T2 diabetes might actually make the problem worse such as causing heart disease and weight gain if only relying on blood-glucose-lowering drugs and insulin. The list above contains all our favorite books and the ones that our community members recommend. Which one have you read? Which one would you recommend that we haven’t included in our list? Let us know in the comment below!